Meanwhile, the silence of the mainstream media over Khader’s hunger strike has grown deafening to the point of absurdity. As I drank my coffee and opened the Sunday New York Times this morning, I was heartened to see an extensive feature by Isabel Kershner on the impact of Israel’s administrative detention policy on a young Palestinian. Astoundingly, there was only one glancing reference to Khader Adnan’s hunger strike – and she didn’t even bother to refer to him by name. But what about someone, right now, resisting Israeli detention practices? Someone whose hunger strike is attracting attention around the world? 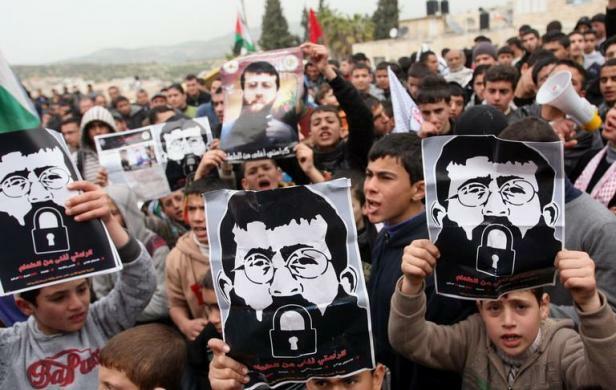 That is Khader Adnan. Randa said that a lot of Israeli journalists had helped her husband’s case by reporting objectively. “We deal with them in the best way possible. It’s important that the world knows that we are not against peace and we don’t hate Jews; we only hate the occupation,” she told the Post. This entry was posted in Hurricane Katrina, Israel, Palestine on February 19, 2012 by Rabbi Brant Rosen. I can’t imagine that Israel would use administrative detention without a good reason. They have so many British colonial laws on the books (e.g the Criminal Laws of 1934) and so many new anti-democratic laws passed by the Knesset since 1978 that they could easily charge anyone they wish under one of those laws and pretty much guarantee themselves a conviction. So they must have a pretty darn good reason for using administrative detention if none of those laws would suffice. I am guessing that need to keep Khader Adnan in detention because it is clear that these people have become severe critics of an Israeli justice system that keeps people imprisoned for no reason. And you just can’t have angry people roaming the streets of an area where tensions are already high because that just creates a more dangerous situation that would require protecting Israel by putting even more people in prison just in case they might be angry enough to pose a threat. So it is clear to me that by keeping Khader Adnan in jail under administrative detention Israel minimizes the necessity of imposing further administrative detentions upon people who can’t even be convicted of laws that make them guilty until proven innocent. We would expect nothing less of a government committed to the security of an undemocratic Israel. Thanks so much, Brant. I was also astounded by the passing reference without a name in Isabel Kershner’s article. There is a such a blatant double standard. Gilad Shalit was the subject of countless articles yet over 300 Palestinian administrative detainees and thousands of prisoners are barely mentioned. I am so grateful that you constantly remind us of this blatant ethnic prejudice and discrimination. We are all indebted to you for your courage and religious leadership. Thanks Rabbi Brant for reminding others of the plight of Khader Adnan and for the Amnesty link. The New York Times as of the 20th Feb has a reasonable story on Khader. You might like to read my response below and see the footage in the link. Israel does not and did not pluck a simple peace loving layman off the street as portrayed in this article. We do not know the specifics of Khader’s case. That’s right – no one knows. Not Khader, not his lawyers, not the human rights community, not the world – because the military court refuses to reveal what, if any, evidence it has against him. I did not write the article and the blog is not mine either. No, the one line does not sum up anything, neither does your response. I will explain. “We”, I assume, refers to the writer, his readers, the public and as you correctly stated, “his lawyers, the human rights community, not the world”. It is contradictory to proclaim that no one knows and then premise that the military court might have evidence against him. It is therefore illogical to conclude that not knowing the specifics means that there is no evidence against him. The article also reports that a judge reviewed the appeal (he was granted the possibility to appeal) and that the case is reported to be under full judicial review by the military and Supreme Court. I am carefully suggesting that since both the military and supreme courts are reviewing the case, there must be something, something which “we” do not know, unless both courts are completely hollow. The article also shows that Khader’s detention is permitted by law, not only Israeli law, but laws which exist in the Western democratic world. As lawful or unlawful you hold these laws, is not for me to debate. My debate is the automatic Anti-Israel bias, slur and distortion of the full picture. Falling in line with the theme of the article – putting Khader in context, I would like to analogize through a real world situation which may hopefully provide a perspective unshielded by Anti-Israel bias. After a long history of certain activities, arrests, calls for unlawful inhumane behavior, you find your local criminal character lurking around your child’s school. You know of previous pedophilic and drug related activity, but it is a free world right? The man is protected by law, he has rights and it is a democracy? Is that what you going to tell your kid whilst picking up the pieces? Come live in the neighborhood, in a house with a bomb shelter, send your kid on the bus which circumvents the local Arab village due to previous bad experiences, then, only then, pass judgment. If you cannot do that, then at least provide your readers with a more balanced picture. Khader is smoking gun, is proud of it, preaches it and leads it. Show your readers the above link! Can you? Please explain why you will send the link or will not send the link. Silence is a deafening admission of guilt. Yes the media silence is deafening! The media has also not shown the above link, nor have you.